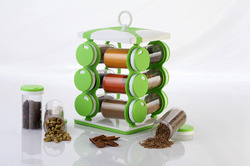 Our product range includes a wide range of spice rack, revoling spice rack and masala rack. New spice rack which will make storing your various masalas and spices as easy as pie while making your kitchen look modern and stylish. The spice rack will make your life easier by helping you organize all your masalas and spices and getting a snug place for all of them. 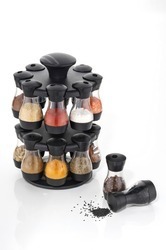 Durable material the stylish spice rack is made from virgin plastic and has a matte finish. The virgin plastic is 100% food grade and is sturdy and reliable. This makes it safe for use in the long run. Stylish design the rack is designed to suit the modern decor of your kitchen and is stylish. This attractive masala rack will make your kitchen the envy of all your friends. The containers are transparent with a colored cap. This ensures that you will easily know when your supplies need to be restocked. The jars are rotatable and hence really easy to use. The spice rack is designed with maximum storage capacity occupying minimal space with a very stylish looks. It is easy to clean and easy to maintain and, therefore, your perfect choice to organize your spice cabinet. Packaging Details: new spice rack which will make storing your various masalas and spices as easy as pie while making your kitchen look modern and stylish. The spice rack will make your life easier by helping you organize all your masalas and spices and getting a snug place for all of them. 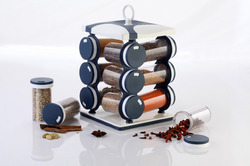 Durable Material The stylish spice rack is made from virgin plastic and has a matte finish. The virgin plastic is 100% food grade and is sturdy and reliable. This makes it safe for use in the long run. Stylish Design The rack is designed to suit the modern decor of your kitchen and is stylish. This attractive masala rack will make your kitchen the envy of all your friends. The containers are transparent with a colored cap. This ensures that you will easily know when your supplies need to be restocked. The jars are rotatable and hence really easy to use. The spice rack is designed with maximum storage capacity occupying minimal space with a very stylish looks. It is easy to clean and easy to maintain and, therefore, your perfect choice to organize your spice cabinet.